People often assume that, as a professional organizer, my home is perfect and my time management skills are amazing. Yeah, it’s just not true. I will have weeks throughout the year where the house looks like a tornado blew through it. I will be late for appointments and, last Friday, miss them completely. I admit it: I blew it. Truthfully, I was really grateful to not HAVE to be anywhere during the morning rush hour(s) because Houston traffic is bad on a good day, ridiculous if it’s raining and (I can only imagine) pure Hell when it’s snowing. 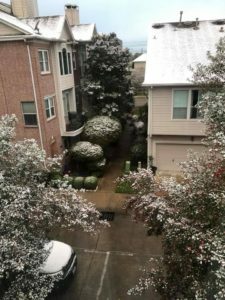 Or has snowed, or in snowing in Dallas… I proceeded to play a few levels of Cooking Fever, make myself a bowl of peanut butter oatmeal and an Americano and watch the first half of “Live! With Kelly & Ryan.” Shoot, I deserved a morning like this; it had been a really hectic week and it felt good to just relax. My client for the day was out-of-state so it didn’t really matter what time I arrived as long as I accomplished the tasks set forth. As I get in my car at 9:45a, I see I’ve missed a call. From the consultation I had scheduled. For 9:00a that morning. I called to apologize, left a voicemail, text and will continue to try to save the relationship but it may be too late. I mean, who wants an organizer who can’t even keep her own schedule organized??? In a nutshell, I feel like a great big jackass but, hey, even organizers aren’t perfect.